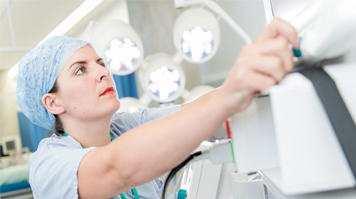 The LSBU Operating Department Practice (ODP) Operating Theatre was designed to reflect hospital acute care environments. At one end it resembles the operating theatre, with operating table, theatre lights, anaesthetic machine and scrub sinks. At the other end a recovery/ITU environment can be recreated. The space is designed for students to work in smaller learning groups. They rotate between different "skills stations" to get hands-on experience of various technical aspects of theatre education in a safe environment. Students are obviously unable to recreate operations outright, but they are taught a range of issues that will eventually help them in an operating theatre, such as patient positioning. There is an operating table, theatre lights, anaesthetic machine, patient monitoring, suction machine and resuscitation trolleys. The fully functioning SimMan (simulator mannequin) equipment is used in recovery and medical emergency modules, where the "patient" can be computer controlled to demonstrate a number of conditions which require recognising and treating by the students. Students also have a scrub area with sinks, gowns and gloves so students can "scrub up". There are various anatomical trainers and we can teach students about airway management and intubation as well as cardiopulmonary resuscitation (CPR). Real-life operating theatre is a stressful environment which can be intimidating for learners. There are specific patient safety issues such as infection control, or more immediate life-threatening measures such as a malfunctioning anaesthetic machine or poorly monitored table attachments which could result in injury. Students feel that in the real life atmosphere of a theatre, with real patients, things happen relatively quickly. It is reassuring for students to be able to practice some of these skills in a less pressured environment.